I used to love to change things around on my Mac. On my old Power Mac 6100, I changed the startup screen - not by adding a "startupscreen" file in the System Folder like most people do, but by actually using ResEdit to change the "Mac OS 8.6" splash screen in the System file to something different. It worked fine; there were no problems. It was when I started adding lots of third party extensions that I had problems. Not only would they conflict with each other, they would also cause the Apple extensions to become corrupt. Eventually I had to reinstall the whole operating system. This wasn't much fun, but thankfully installing OS 8.6 didn't take that long. If you think about it, though, Mac OS 7-9 was fun to customize. There was Kaleidoscope, probably one of my favorite Mac add-ons. 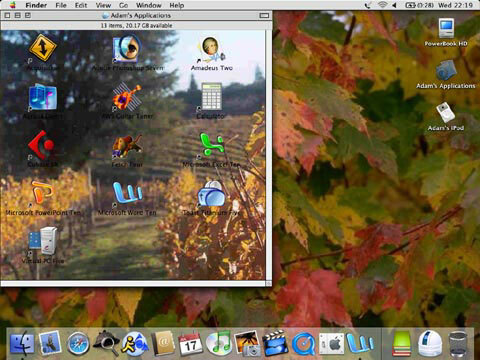 It allowed your Mac's interface to look like just about anything you could want. I even remember a Windows 95 scheme! Power Windows allowed you to drag your windows as solid windows, not just outlines. iMacolor changed the color of the Apple menu and the trash can. In OS 8.5, Apple introduced themes, which supported the kind of theme changes previously found only in Kaleidoscope. At least it would have, if Apple had decided to ship OS 8.5 with other themes. Instead, Apple only had Apple platinum in the Themes folder. There were countless ways to change your Mac's appearance, and it was fun to do. Mac OS X has virtually no options compared to the classic Mac OS. There is an application a bit like Kaleidoscope; it's called Duality. It allows you to change the theme, but the changes it makes aren't quite as extreme as the changes that could be made with the classic Mac OS - although I did come across a Windows XP theme for those interested. There's virtually nothing you can do with the dock, however. In fact, about the only thing you can do if you don't like it is hide it. I'd love to see an application that forces the dock to quit and allows you to use an application menu like we had in OS 9. As nice as the dock is sometimes, it can get very annoying, and hiding it can be even more annoying, especially if you happen to move your mouse down to the bottom of the screen for a few seconds while you're working in an application. In terms of Apple and OS X, Apple wants to deliver a "trademark image." It wants the OS to be easily identifiable, and it uses the OS X desktop to do this. The traffic light buttons and the dock make it stand out from Windows or OS 9, and Apple wants it that way. They don't want you playing around with it. Because of that, they don't offer any "built in" themes or extensive options for the dock. It doesn't mean you can't play with OS X a little bit. For instance, I've taken advantage of the theme changing capabilities of Duality and installed the Classic Platinum theme. It's simpler than OS X's Aqua theme, and I also find it faster, since it doesn't use transparent menus. I think the gray is also easier on the eyes than Aqua's striped pattern. It's definitely much less of a distraction. I've changed my hard drive icon, added an application folder on the desktop with which I've taken advantage of the ability to change icon sizes to make it more like the Launcher in Mac OS 7-9. I've basically left the dock as-is, but I have added a couple shortcuts to folders that I use often. By contrast, my beige G3 tower at home has got an all-black gothic kaleidoscope theme, Century Gothic system font, and Skia icon label font. I've changed the menu highlight color to yellow. All of my icons have been changed by the theme, and I've added the Application Switcher along the bottom of the screen, something like the dock (except I can get rid of it when I want). I'd like to see more customization in Panther, whenever I may decide to upgrade to it, but I doubt that will happen. But even with Jaguar I've successfully changed the startup "Welcome to Macintosh" screen to display my name and phone number - in case my PowerBook ever gets lost, whoever finds it (provided that they're honest enough) will know exactly who to return it to. And it was actually a bit easier to do than in OS 9.